The sound of waves crashing on the white sand, the colors of the sky changing from blue to orange and pink… You and your love immersed in the moment. Sounds like the perfect romantic trip, and it can easily happen when you travel to The Philippines. It’s time to list our romantic places in The Philippines, and inspire you to book a romantic trip! Rob and I have traveled to The Philippines a few times, and I’m sure we only know a tiny piece of the stunning country made of more than 7 thousand islands. But our experience in romance and romantic places in The Philippines is good enough to give you travel tips to paradise. Boracay is one of the most famous island in The Philippines (and in the world), many people think about Boracay as a place of endless parties. And yes, the island have great bars and clubs, but Boracay is much more than that, and it’s on the list of the most romantic places in The Philippines. In Boracay you can find everything: good restaurants, from 5 stars hotels to budget accommodation, water activities, parties and stunning beaches. It is a small island, only 7 km long and less than 1 km wide, but has a lot to offer, especially for people in love. Boracay is the perfect romantic destination in The Philippines for lively people. The mix of nature, party and relaxing moments is a good match for modern couples. To get the best of Boracay you need to know where to stay and where to go. White beach is where the action happens, and it’s divided into 3 parts: Station 1 with top hotels. Station 2 is the busiest area with restaurants, malls and groups of tourists. Station 3 is the laidback area, with local bars and small guesthouses. Choose the station that suits you better, and find romantic places to have dinner and sip cocktails by the beach. Another important thing, at 6pm you must rush to the beach, sit and admire the sunset. If you want to spice up the moment bring a bottle of wine to celebrate love! For more romance book a private boat and go on a ride around the island. Ask the captain to organize lunch in one of the secluded beaches, stop in good places to snorkel and sail until the sunset. I have no doubts you two gonna remember this day forever. There are many things to do and see and Boracay, so If you want to plan a trip to this magical island read our article with all the tips you need to travel to Boracay! There are many types of couples, and some of them love adventure! So if you are one of those who don’t waste time relaxing by the pool and want to discover the world with your partner, go to Bohol!! This island is waiting to be explored and I’m sure Bohol will amaze you! What makes Bohol one of our favorite romantic places in The Philippines? Nature and Adventure. We feel thrilled doing adventurous activities together, and Bohol has the perfect mix of adrenaline, calm beaches, and local experience. The island is packed with natural wonders like waterfalls, forests, rivers, the famous Chocolate Hills, dive spots and pristine beaches… All that will make you and your partner busy. It will be adventurous days and romantic nights. Panglao is the most touristic area of Bohol, there you can find stunning resorts and good restaurants. 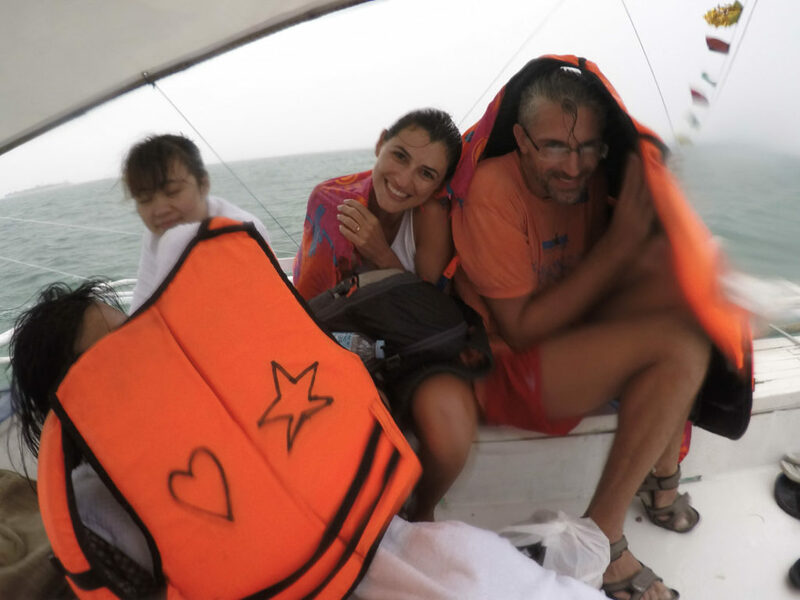 But don’t stay only there, the adventure is spread all around the island from Loboc River, Antequera, Loay and Anda. Rent a motorbike and explore the tiny fisherman villages, the historical places, snorkel with colored fishes and giant starfishes. 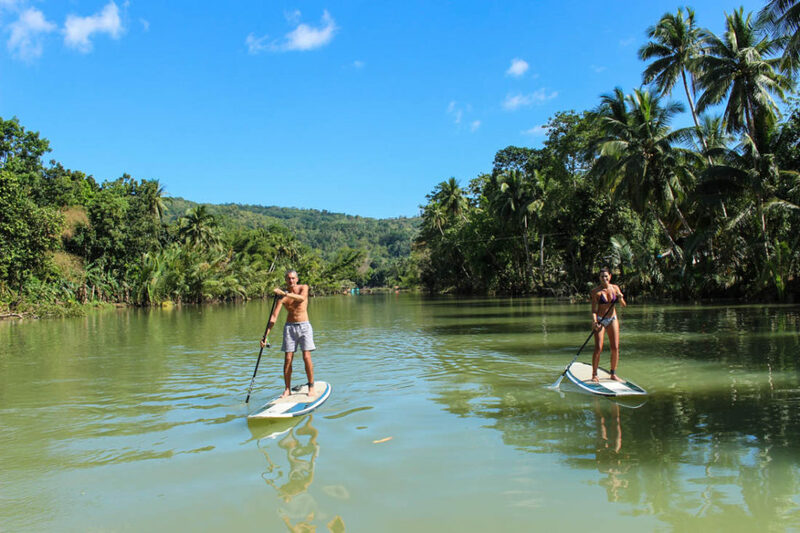 If Bohol is your type of romantic destination follow our guide to things to do in Bohol and how plan you trip to this amazing island. El Nido is famous for its nature, the giant rock cliffs and the crystal clear sea. It is one of the most famous and most romantic places in The Philippines. Nature is preserved and the beaches are gorgeous. Many islands in EL Nido are still untouched, waiting for you to admire them. There is nothing more romantic than be with your lover in a paradisiac place. El Nido is the magic combination between unspoiled nature and eco-luxury resorts. No doubt Pangulasian Island is one of the most romantic places in The Philippines and in El Nido. I traveled to this little paradise a month ago, and I was overwhelmed by the beauty and exclusivity of this private island. 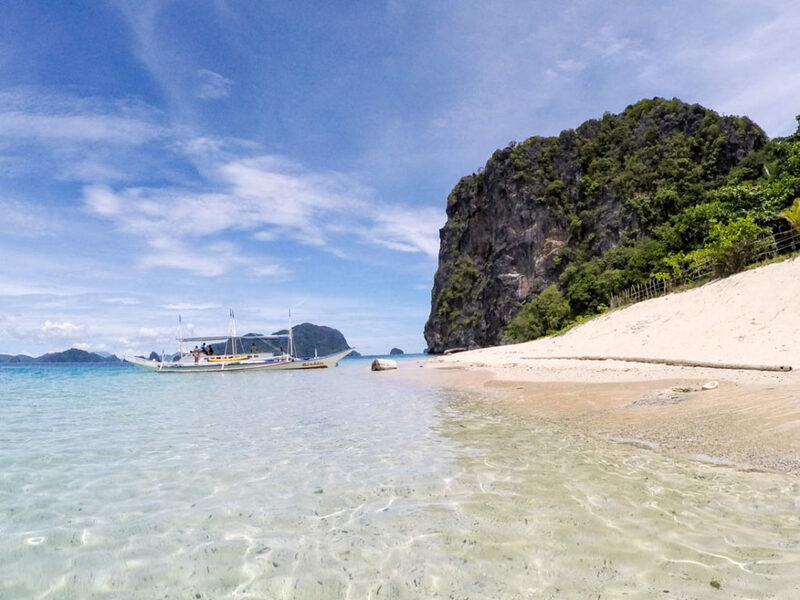 Pangulasian Island is the place to be when you travel to El Nido. I’m sure I left half of my heart there! 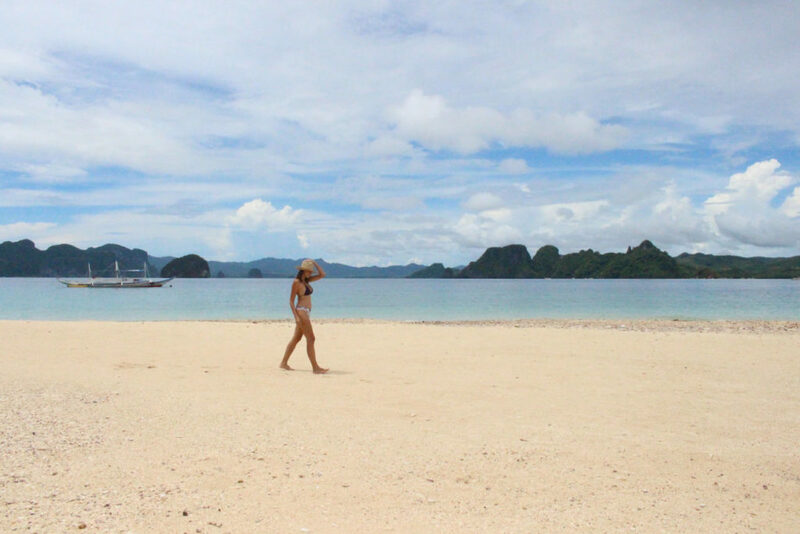 Why is El Nido one of the most romantic places in the Philippines? There are a bunch of water activities and things to do in El Nido, but I recommend the islands for couples who want to relax, indulge themselves in heavenly massages, celebrate romance in candlelight dinners and soak under the sun while discovering empty beaches. How to plan your romantic trip to The Philippines? » When to travel to The Philippines? The best months to travel to The Philippines are November to May, with the hottest period between March and May. This is the dry season so expect good weather and also a lot of tourists. From June to October is the rainy season, with the wet weather the hotels became cheaper and the beaches empty. Be aware that September and October are the typhoon season. For accurate info about the weather in The Philippines check their official website. » How to get to The Philippines? Travel to The Philippines means flights, plus boats and a well-planned itinerary. Manila is the entrance door of the country, and most of the long-haul flights arrive and departure from there. The weather plays a big role in The Philippines, so leave spare time between flight connection and boat transfers. The easiest way to travel to Bohol is to fly to Cebu International Airport and then take a fast boat to Tagbilaran, the main town of Bohol. To travel to Boracay you can flight to Kalibo International Airport and then take a bus + boat transfer. Or a flight from Manila to Caticlan Domestic Airport, and then take the boat to Boracay. El Nido is the farthest romantic destination in The Philippines. You have to flight from Manila to El Nido Airport and take boat transfer to the island you choose to stay. Or take a flight to Puerto Princesa Airport and face hours of bus + boat. Paradise is not easy to reach, but it’s worth it! So grab your partner and face the challenge! » How to book the best and most romantic hotel in the Philippines? In The Philippines you can choose your accommodation by your budget, style or romance mood. You can use Traveloka to find the best accommodation The Philippines. Book your room in advance and talk with the hotel staff to organize the pickup service, and maybe a romantic setting in the room. El Nido, Boracay and Bohol are our favorites romantic places in The Philippines, but I’m sure there much more. So pack your swimsuit, grab you lover by hand and fly to paradise. Be prepared for days and night of amazing nature and romance. Are you ready to celebrate love in Paradise?! Forward this post to your beloved one and start planning your romantic trip to The Philippines right now. I have just book marked this article as I am heading to The Philippines in October. Going with my son, so romance isn’t on the cards, but will be looking at your other posts as well. Feel free to browse around the blog, there are many posts about the Philippines, and if you need any extra tips, send us a message! I’m sure you and your son will love The Philippines, such a great country. I love the Philippines, but then again, I’m biased. 😉 Despite my travels taking me everywhere, I always look back to coming home to its beaches! Aleah, you are so right, there is no place like home, especially if your home is the Philippines! Your country is gorgeous, blessed with stunning nature and lovely people. You should be always proud and happy of this! Wow, lots of amazing places to visit in the Philippines, I need to get there soon! Noel, you must travel to the Philippines soon! It’s a lovely country and the nature outstanding! I am from Philippines and happy to know that you had a grand time during your visit. I have been to most of these beaches and happy to share that its also great for solo travel! Thanks for your comment Carla! We always travel together, so we get a different perspective from the places we visit. It’s good to know that The Philippines is also a lovely destination for solo travellers, especially for girls! You have captured great photos here and wow, what stunning sunsets. It looks a place of outstanding natural beauty. Thanks for the information on when to travel there, that is really useful for planning a trip. The Philippines is a paradise, but you need to travel there on the right time to avoid the rainy season and get the best of the country and its nature! I agree with El Nido and Boracay 100% – Infact, I have been there and almost every place in Philippines is just amazing, isn’t it? I was especially surprised at how clean the white beach was with the amount of tourists and party goers it sees. Just awesome. Good to hear that you agree with me, Jo! 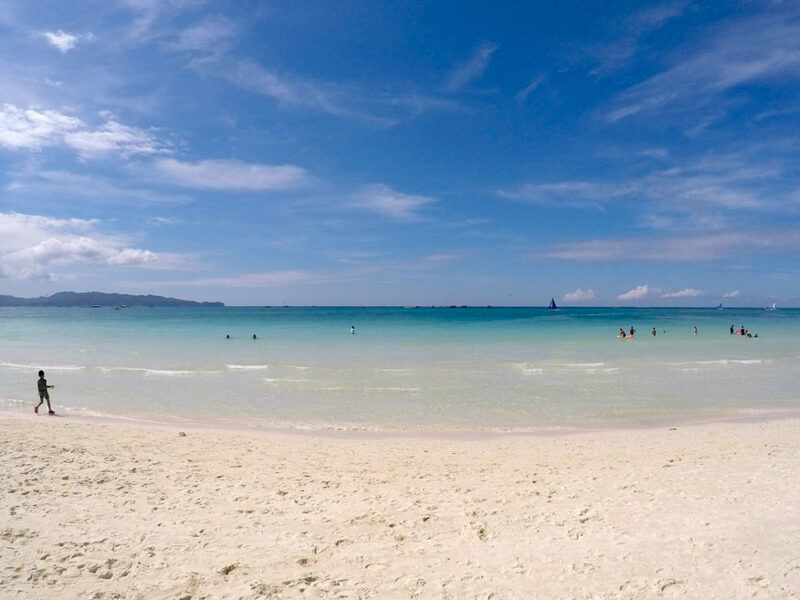 The white beach in Boracay is out of this world, so white that hurts when you look at it under the sun. I was surprised how clean the beach is, especially during high season. They do a god job preserving it. Thanks for stopping by! That sunset picture is beautiful! We are planning our way too, for sure we gonna catch up during the TBEX and hopefully on the pre-activities! With the white beaches and the endless amount of activities that can be done, the Philippines definitely makes a perfect honeymoon destination. Your cover photo is lovely! Philippines has so many things to do and see, that is the perfect romantic destination or types of travellers and couples! There are lots of beautiful islands in the Philippines, really perfect for couples. 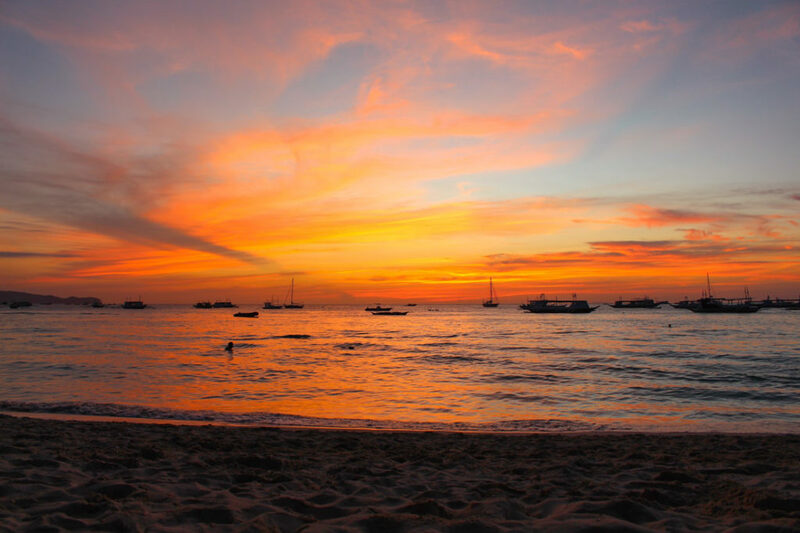 The beautiful beaches and romantic sunsets are surely to be admired. It will not be a boring date when you’re out there for a romantic getaway. You are right Dave, Philippines is never boring! There are so many things to do in see that you will be busy the whole trip! Great article! 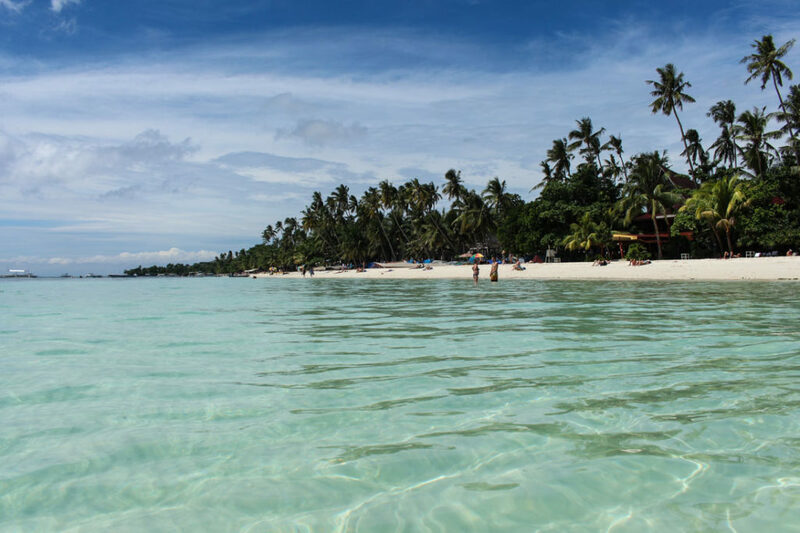 I agree Boracay is one of the most famous beaches in the Philippines, I’ve been there, you could also try going to Davao Pearl Farm Resort, it’s worth it! I’m falling more in love with Philippine destinations every time I travel during their summer season. Hoping to see more of your adventures! We didn’t visit Davao yet, but it~s on or list. I have heard good things about there, especially the food. So many beautiful and romantic places in the Philippines. Really tough to pick but I guess I’d choose Bohol for the adventure! This post is perfect for anyone looking to plan an unforgettable honeymoon in the Phillipines . El Nido looks devine! My husband and I went to both Bohol and Boracay- both amazing spots! The Philippines is so magical isn’t it?! The Philippines look so amazing! I would love to explore the islands sometime soon. Bohol sounds like it would be right up our alley and the beaches and relaxation in El Nido sound fantastic! Great photos!! That stretch of white sand in Boracay reminds me of Shoal Bay in Anguilla. I can’t imagine a more perfect beach! Both Boracay and Palawan are on my to-do list but I’m also interested in visiting Bohol. I can see why it is a great place to visit with a significant other….too bad my boyfriend has such limited vacation days! The Philippines is the perfect holiday destination, try to convince him to get some extra days on the next holiday and fly to paradise. 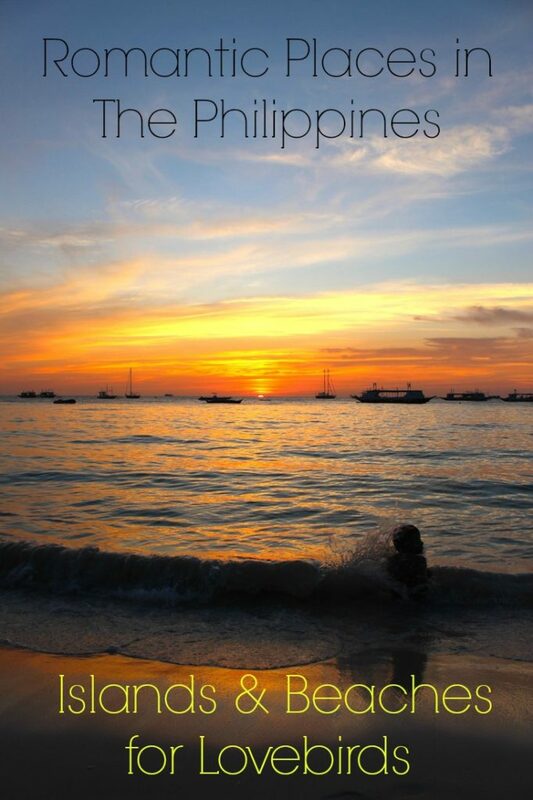 The Philippines are definitely on my list! I think Bohol sounds like the perfect balance of a beautiful place and fun activities. Will have to key it in mind when I get my chance to visit. I think Bohol is one of my favourite islands too. Hi Nat and Rob! Wow all these romantic places…I love Philippines, too, even when I mainly traveled there by myself. I can imagine it is the perfect honeymoon destination, especially Bohol or El Nido. The Philippines is incredible, we are dying to go back and explore more of this stunning country!